No. 3 seed Purdue's season may have ended in the Elite Eight, but Carsen Edwards' performance in this year's NCAA Tournament has put his name all over the NCAA record books. Edwards led his team in every game they played, including on Saturday when he scored 42 of the Boilermakers 75 points. No other player scored more than seven on his team. 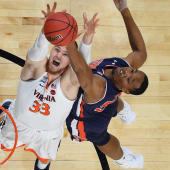 Virginia, built on a strong defense, had previously allowed games of 40, 40 and 42 points this year against them. But that was by an entire team. Let's take a closer look at how crazy Edwards' four-game stretch really was. Edwards banked in a 3-pointer to take the lead with 1:09 left for his 10th made 3-pointer of the game and a tournament-record 28 3-pointers. Glen Rice had the previous record with 27 makes, but he did that in six games compared to Edwards' four. Edwards 3-point shooting was on a different level in March. He crushed the tournament record of 3-point field goals made per game. The previous mark was 5.75 makes per game, set by Davidson's Stephen Curry and Loyola Marymount's Jeff Fryer. Edwards averaged 7 makes per game. He also became the first player to make nine or more 3-pointers in multiple games in tournament history. In Edwards 3-year NCAA Tournament career, he hit 38 3-pointers in 10 games, which is two shy of ranking in the top five all time. Edwards averaged 34.8 points per game, tied for the ninth most in tournament history, and the most since 1990. No player has even managed to average 30 points per game in a tournament since Jimmer Fredette in 2011. Edwards is a junior, so there is a chance we can see him back in the tournament next year for even more records to be broken, but after performances like this, he may be playing on a bigger stage next year.